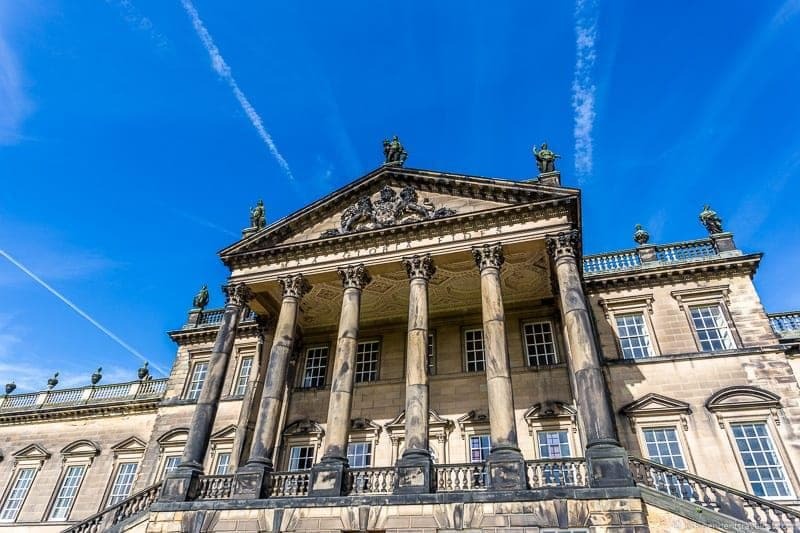 Wentworth Woodhouse is the largest private home in the United Kingdom and it has the longest façade of any country home in Europe; however, very few people have ever heard of this spectacular English house! Starting as a modest Jacobean house in the 17th century, it would be rebuilt and expanded to enormous proportions by a series of aristocratic families. The house would become the seat of the Earls Fitzwilliam who would rise to be one of the wealthiest families in England due to profits from the coal industry. At one time, over 1,000 staff members would be employed to run and look after the 300+ room house and the vast estate. However, a series of scandals, inheritance fights, untimely deaths, and the nationalization of coal would soon lead to both the end of the Earl Fitzwilliam line and the shuttering of this great house. 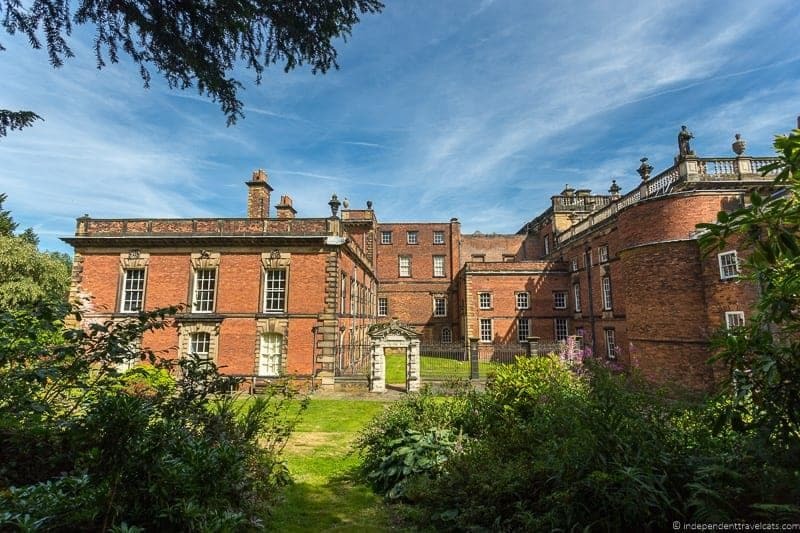 This grand Yorkshire house was closed to the public for decades but opened for public tours in 2012, and new life is being breathed into this old house. 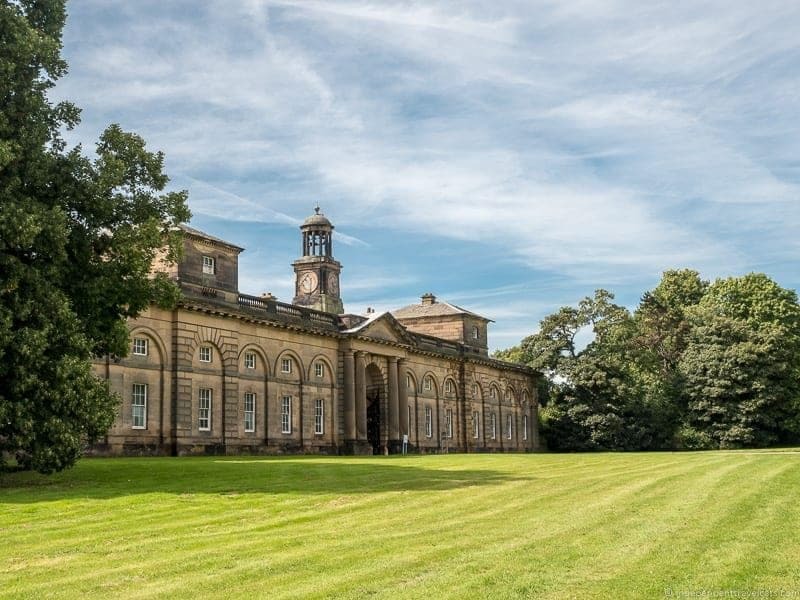 We’ll share some of the fascinating history of this house and its occupants, tell you all you need to know to visit Wentworth Woodhouse yourself, and share details of our own recent tour of Wentworth Woodhouse. We think once you know the story of this house, you’ll be intrigued to visit it too! 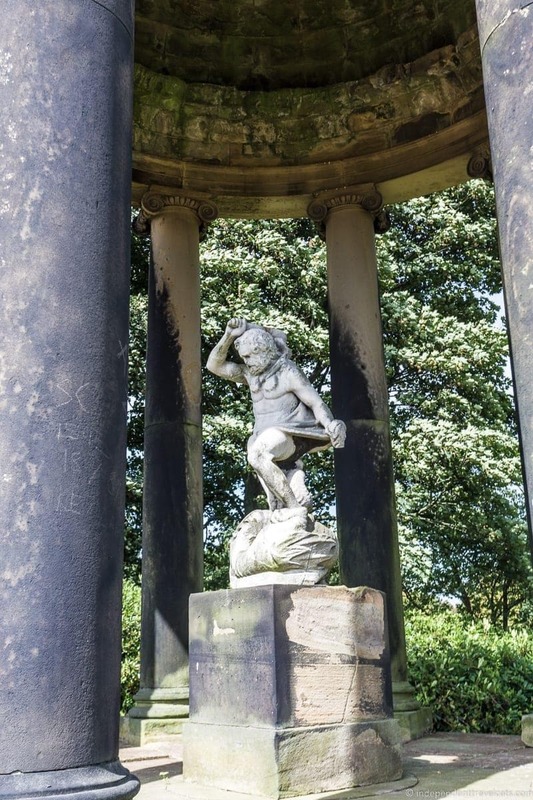 Where is it Wentworth Woodhouse located? How to Get to Wentworth Woodhouse? Cost of Tours at Wentworth Woodhouse? 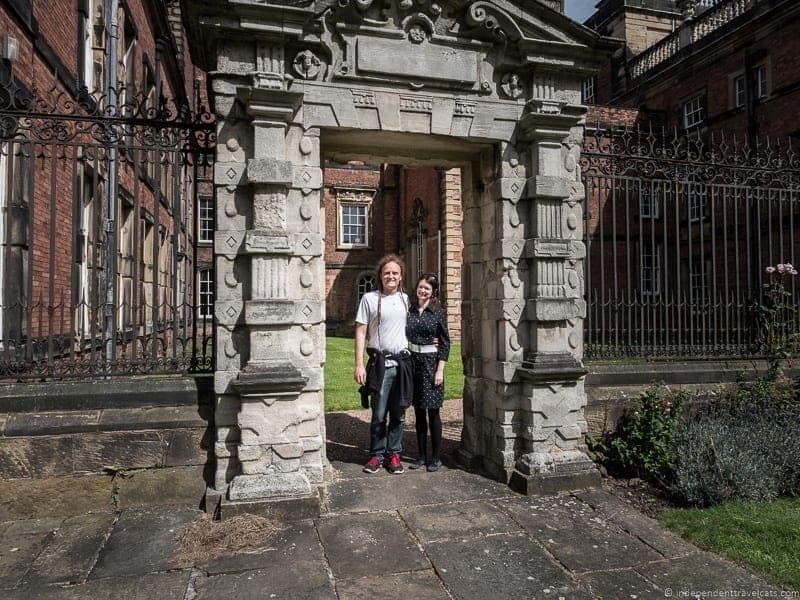 What Wentworth Woodhouse Tours Offered? How do I Book a Tour of Wentworth Woodhouse? Food and other services Offered? Can I Visit Wentworth Woodhouse without booking a tour? How to Find out more Information about Wentworth Woodhouse? Other Nearby Places to Visit with a Wentworth Connection? Wentworth Woodhouse is located in the town of Wentworth in South Yorkshire in northern England. The estate is located about 10 miles from Sheffield (~40 min drive), 30 miles from Leeds (~50 min drive), 40 miles from Manchester (~1 hour, 45 min drive), or 170 miles from London (~ 4 hours drive). You can either drive, take public transportation, or hire a taxi depending on where you are traveling from. If you are flying or taking the train, you can then get to Wentworth Woodhouse via bus or taxi. If you are driving, there is on-site parking available about 300 yards from the house. You can also find parking in the village of Wentworth, there is a large long-stay car park on Hague Lane which also serves the Garden Centre and short-stay (three hours max) parking is available for a limited number of cars within the center of the village. There is also disabled parking for Blue Badge holders visiting the house. If you are traveling via train or bus, depending on where you are coming from you’ll want to try to connect to the bus stop in Wentworth (e.g., Clayfield Lane bus stop is only a 9 minute walk from the house). There is no train station in Wentworth, but you should be able to connect via bus from a nearby train station (e.g., Rotherham). If you are flying, Leeds Bradford Airport is the closest airport but has limited flight connections. The nearest major airport is Manchester Airport and it is about a 1 hour, 45 minute drive from Manchester to Wentworth Woodhouse. Tours of the house are currently priced (as of September 2018) at £20 per adult (age 16+) and £10 per child. Tours of the gardens are £5 per adult (age 16+) and £2.50 per child. National Trust Members (England and Wales) save 50% on admission prices. There are currently 3 different tours offered at Wentworth Woodhouse. The two house tours cover different sections of the house and the Gardens Tour only covers the gardens. Tours are approximately 1 hour long and are led by a guide. Future tours are planned that will cover even more rooms of the house, more of the garden, and the village of Wentworth. All tours must be pre-booked in advance to visit the house, so don’t show up without a reservation! Note that photography was not allowed inside when we visited in 2016 but this policy changed in 2018 and photography is now allowed by during the guided tours inside Wentworth Woodhouse. Photography is also allowed in the gardens. You must book a tour in advance, and if you want to do a weekend tour, you must pre-book the tour by Friday at 3:30pm. You can book a tour online, by phone by calling (01226) 351161. Only parts of the house are wheelchair accessible due to the historical nature of the house. 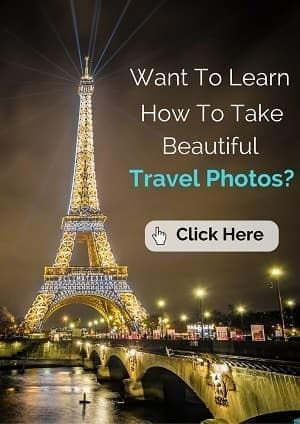 So if you or someone you are traveling with has a physical mobility issue or disability, I would call well in advance to see if a tour is possible and make any necessary arrangements. There is a small tea cafe that is typically open during tour hours that serves snacks and drinks. There are also toilets open to tour visitors and a small gift shop area. Meals are not served at the house at this time, but there are cafes and pubs within walking distance in the village of Wentworth. Yes and no. You can’t visit the house or its interior or the private garden without a tour, but you are welcome to explore sections of the vast Wentworth estate on your own for free. There are a number of trails and paths open to the public that go through the village and deer park. 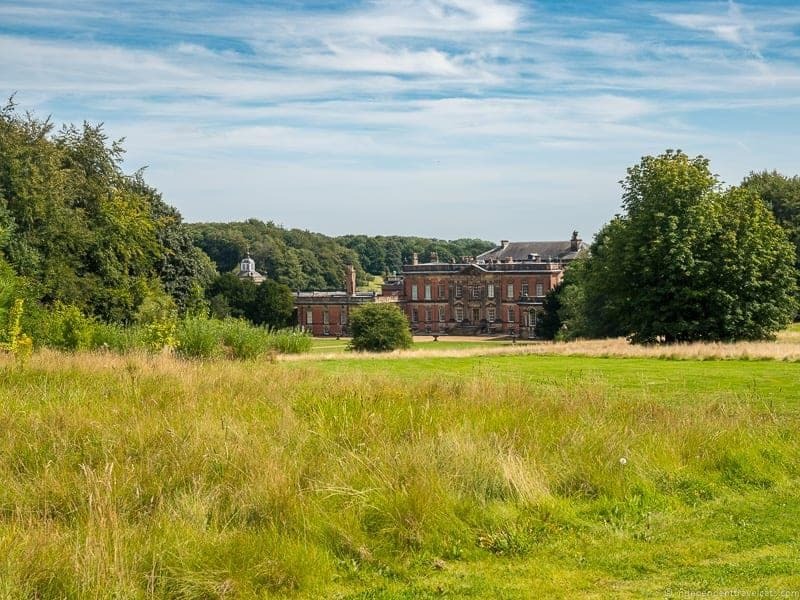 The most popular trail is probably the Trans Pennine Trail which passes through the deer park and offers a good view of the Eastern front of Wentworth Woodhouse. Dogs are allowed on the estate (but not in the house) as long as they are kept on a lead. There are also several monuments and follies in the parkland that can be seen and some of the interiors can be visited on certain days. Seasonal fishing in the ponds and lakes on the property is also possible with a permit. Check online for more information about visiting the Wentworth Estate, which is still overseen by Fitzwilliam descendants. 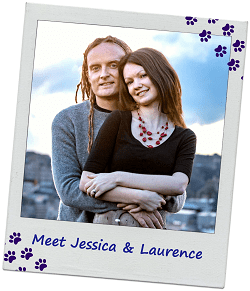 To find out more information about visiting the house, you can explore their official tour website or give them a call. If you wanting to learn more about this intriguing house and its inhabitants, books recommended by Wentworth Woodhouse staff include The Country House Revealed by Dan Cruickshank and their own house tour book (sold in their gift shop), and they also recommend the The Country House Revealed TV series with one episode devoted to Wentworth Woodhouse. I can personally recommend the informative but entertaining Black Diamonds: The Downfall of an Aristocratic Dynasty and the Fifty Years that Changed England by Catherine Bailey which is the book that initially got me interested in exploring Wentworth Woodhouse. The book not only provides a good history of the house and family, but gives a good insight into the British coal industry, the tough lives of the families that lived in the pit villages, and the divisive class struggles of 19th and 20th century England. 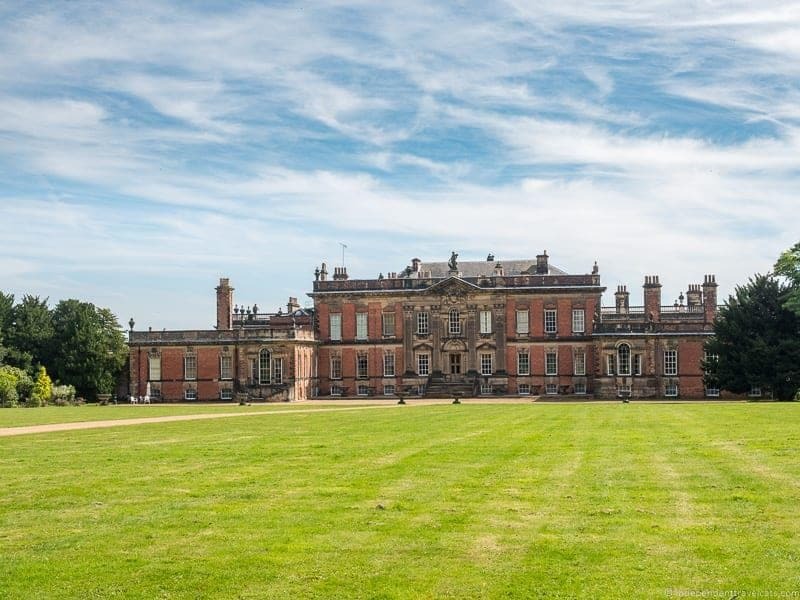 You can easily spend a day or two in the area visiting places connected to the Wentworths and Wentworth Woodhouse. 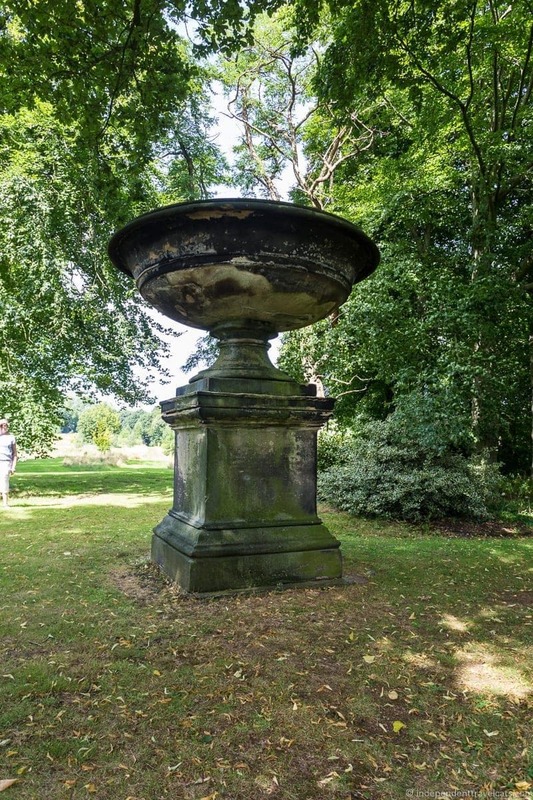 I would definitely encourage you to allow extra time to walk around and explore the Wentworth Estate with its large amount of parkland, lakes, and interesting follies. The village of Wentworth is also an easy place to explore on foot before or after a visit to Wentworth Woodhouse and the parkland. Here you’ll find a couples of pubs, inns, the Village Shop, and the village’s two Holy Trinity Churches (both built or rebuilt by the Wentworth family). 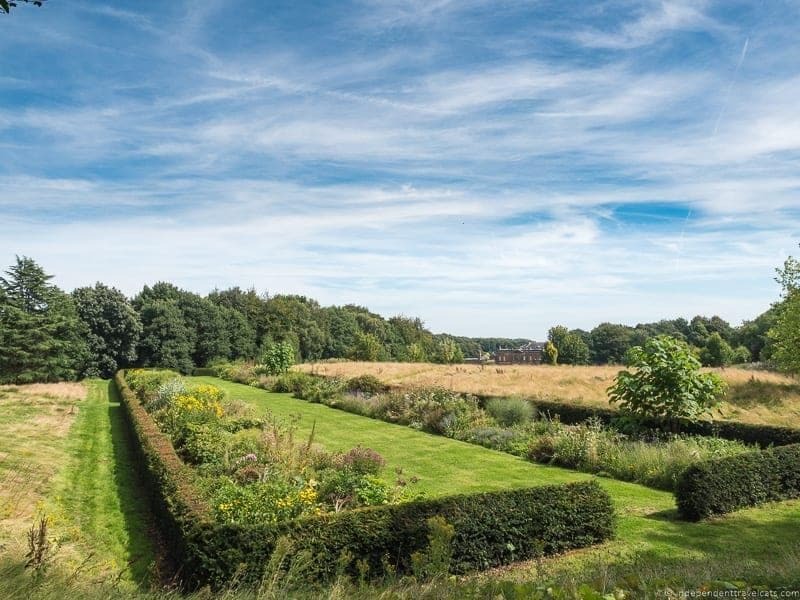 Next door you’ll also find the Wentworth Garden Centre, which is set within the historical kitchen garden and pleasure garden of Wentworth Woodhouse and you can still see the walled garden here. 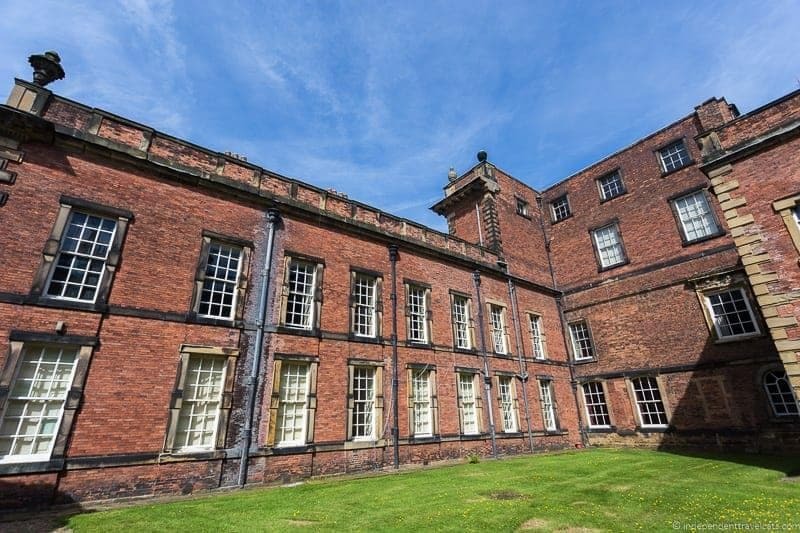 Nearby, you might also want to visit Wentworth Castle (owned by a separate line of the family) and the Elsecar Heritage Village (a conservation village with craft workshops and a heritage railway). Elsecar was once a booming village owned by the Wentworth family producing iron and coal in the 19th and 20th century. In 1912, King George V would make a descent by cage into Elsecar Main Colliery, the first time a British monarch entered a coal mine (perhaps the only time?). The house we see today can actually be thought of as three separate houses. The original house was built here for Thomas Wentworth, the 1st Earl of Stafford, in the 1630s. Thomas Wentworth was an advisor to King Charles I and was famously executed in 1641. The house and land passed down to his son after his death. Later, it would be Thomas Watson-Wentworth, 1st Marquess of Rockingham, who would have the original Jacobean house rebuilt and expanded in the 1720’s in the Baroque style (this is the red brick part of the house). The English Baroque style West Front was built from about 1725-1734. This was obviously not big or grand enough for the Wentworths who felt the Baroque style was now out of fashion, and plans were soon drawn up for an entirely new eastern wing of the house to be built in the Palladian style back-to-back with the Baroque wing (this is the part of the house that can be seen from the park). The East Front of the house was started before the West Front was even finished. Throughout the 18th century, the house would continue to be expanded by Thomas Watson Wentworth and his son Charles Watson-Wentworth. Architects who worked on the house included possibly Inigo Jones (17th century gateway is attributed to him), Ralph Tunnicliffe (English Baroque addition), Henry Flitcroft (Palladian West front), and John Carr (additions to Palladian West front and numerous estate buildings and follys). Wentworth Woodhouse would soon become the largest private home in England. As a leading Whig grandee, Charles Watson-Wentworth would use the grand house as a showplace for Whig power. The house and its contents would soon pass down into the Fitzwilliam family, related by marriage, who would own the house from 1782 to 1989. By the end of the 18th century, the wealth of the family would greatly increase thanks to the discovery of vast amounts of coal from the rich Barnsley seam on their South Yorkshire land. Although involved in several industries (e.g., iron, agriculture, pottery), it would be coal that would make the Fitzwilliam family one of the wealthiest families in England. Money was no object for this family who furnished the 300+ room house elaborately, employed about 1,000 staff members on the estate, and hosted important political figures, aristocracy, and royalty. At the death of the 6th Earl in 1902, the family’s fortune is estimated to be equivalent to £3 billion. If you’ve seen Downton Abbey, the fictional Crawley family would have had nothing on the real-life Fitzwilliams in their heyday. However, less than 50 years later, the downfall of the house and the family would come in the 1940’s. Two sets of death duties and the nationalization of the coal mines would reduce the wealth of the family. To pay the death duties, the family would sell off many pieces of valuable art, furniture, and artifacts. After the Second World War, coal was badly needed in a depressed England and there were severe shortages due to a decreased workforce and increased need. The government, specifically the Minister of Fuel and Power Manny Shinwell, who had a personal animosity against the wealthy aristocracy, ordered for the gardens of Wentworth Woodhouse to be dug up for opencast coal mining. 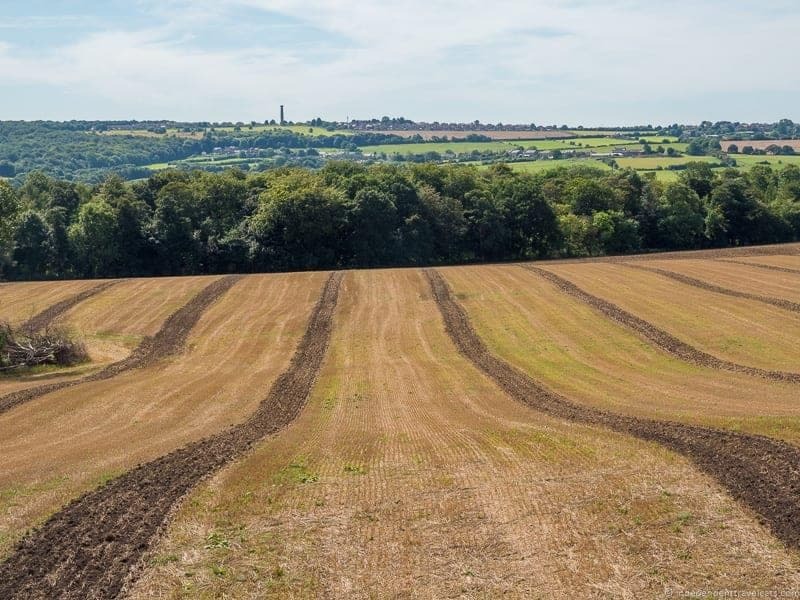 Although the Fitzwilliams and many others who did not want to see the gardens and house destroyed fought against the decision, the estate would become one of the largest opencast mining sites in Britain. The mining would destroy the gardens and the machines dug within feet of the house itself. In time, more than 132,000 tons of coal were dug out of the gardens and this digging would eventually lead to foundational issues of the stately home. Perhaps the final important event in the downfall of the house and family was the unexpected death of Peter, the 8th Earl of Fitzwilliam. He would die along with his lover Kathleen Kennedy, sister of future President John F. Kennedy, in 1948. He left no male heir, so the house was passed to a much older second cousin with no children. After the 8th Earl’s death, the family would soon turn the house over for use as an educational facility. It would be leased by the Lady Mabel College of Further Education and then Sheffield City Polytechnic until 1988. During this period, the Fitzwilliam family would still retain a suite of rooms and staff for private living use. 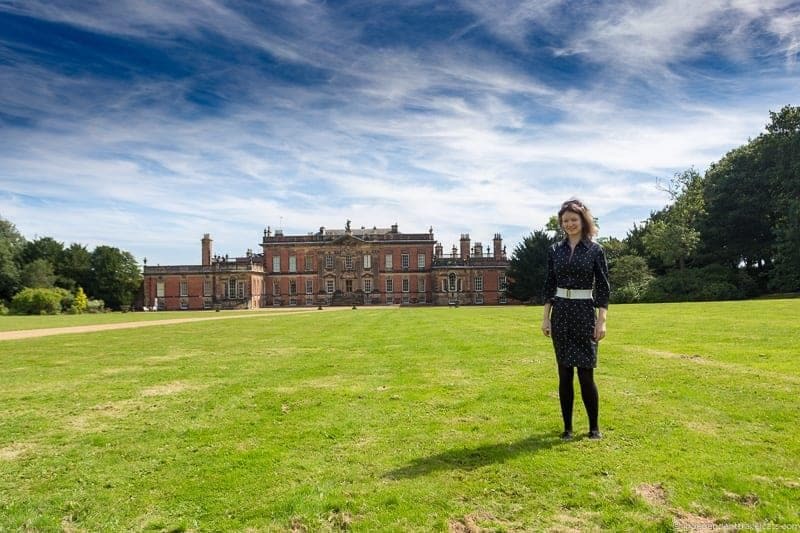 In 1989, the Fitzwilliams would sell the house & around 90 acres of land, but they retained control over the vast park and many of the artistic treasures taken from the house. The buyer was Wensley Haydon-Baillie, an infamous English businessman whose financial situation would steeply decline in the 1990’s. In 1999, the house was bought by Clifford Newbold, who as an architect wanted to fix up the house as a retirement project and to open it back up to the public. He also had plans to convert parts of the house into a museum, a hotel, and an event venue. Newbold bought the house for only £1.5 million as although there was a lot of interest in the house, there were few serious buyers. In 2012, Wentworth Woodhouse would be opened for the first time for public tours. Clifford Newbold would die in 2015 and the house would be put back on the market. It would be the Newbold family who would be largely responsible for opening up the house to the public, seeking reparations from the Coal Authority for the damage from the opencast mining, and fighting for the future preservation of this house. Life is being breathed back into Wentworth Woodhouse once again. Although the house is believed to need at least an estimated £42 million for repairs and restoration, great gains have been made recently. 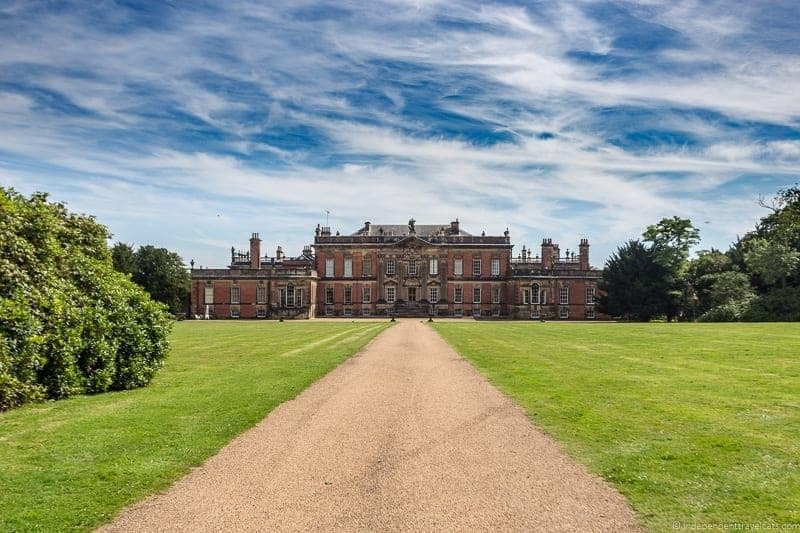 In 2016, the house was sold to the Wentworth Woodhouse Preservation Trust for £7 million. The Trust plans to raise funds to restore and preserve the house and keep it open to the public. After a long legal fight with the UK Coal Authority, it was announced in November 2016, that the government would award £7.6 million towards restoration for the damage done by the Labour government after WWII. 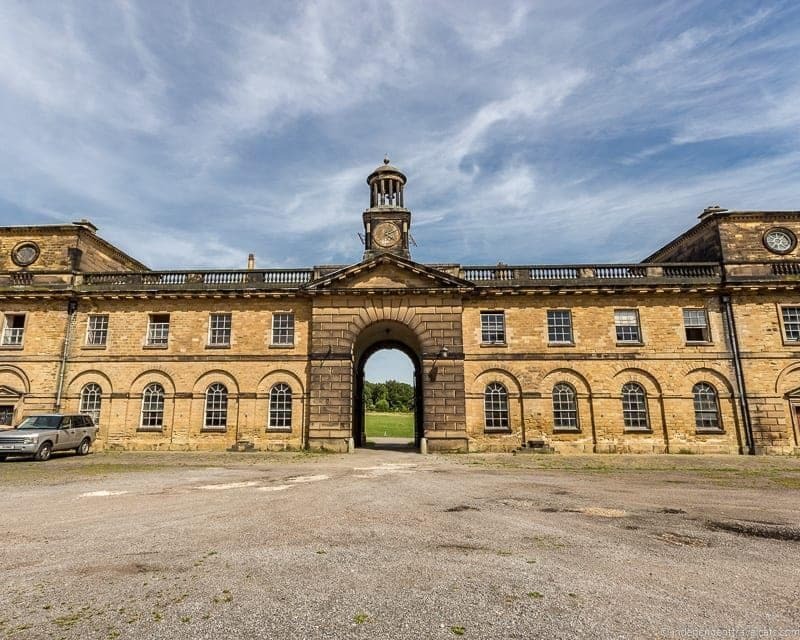 In 2017, Wentworth Woodhouse Preservation Trust received a grant of £3.5million from the National Heritage Memorial Fund, and the National Trust has said it would help collaborate in preserving the historic home. The house has a long road ahead as it is in great need of substantial repairs but it is hard to think that a house as great as this one will not be saved and preserved for future generations of visitors! I loved learning about the history of Wentworth Woodhouse and the aristocratic families who lived here: the Wentworths, Watsons & Fitzwilliams. These are some interesting pieces of information we learned either during the tour or from reading Black Diamonds. The Wentworth family have owned land around the village of Wentworth since the 13th century, but the first known house here was built by Thomas Wentworth, the 1st Earl of Stafford, in the 1630s. The ill-fated Earl gained significant power as an advisor to King Charles I but would be executed in 1641 with consent by the king who wanted to appease the Parliament. The Wentworth/Watson/Fitzwilliam family would have a number of inheritance issues and rivalries over the centuries. The first to concern Wentworth Woodhouse was when William Wentworth, 2nd Earl of Strafford, died in 1695. Instead of leaving it to the expected Thomas Wentworth, it went to a cousin Thomas Watson. 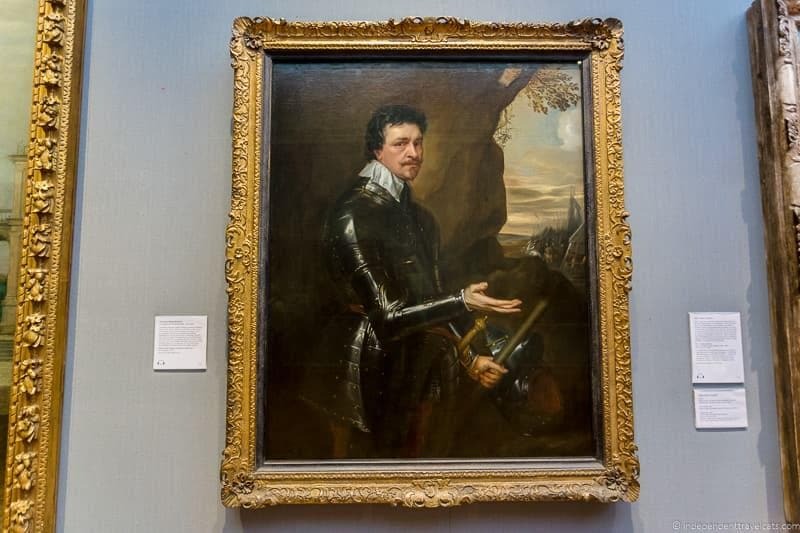 Thomas Wentworth felt he was the rightful heir to the title and estate, and for generations the two sides of the family would compete for political and social power. This would be one of the reasons for the grandeur of Wentworth Woodhouse and nearby Stainborough Hall/Wentworth Castle, which were owned by the separate rival branches of the family. Charles Watson-Wentworth, 2nd Marquess of Rockingham, had many follies constructed on the estate in the 18th century that were designed by John Carr. One of these, a 46 ft. tall pyramid shaped folly called Needle’s Eye, is said to have been built for the Marquess to win a bet as he said he could “drive a coach and horses through an eye of a needle”. If you look closely at the folly, you’ll see a number of musket-ball holes at around head height, and it is believed it may have been used as a location for a firing squad. In 1771, American statesman Benjamin Franklin would visit the north of England and Midlands, making stops at both Wentworth Woodhouse and Chatsworth. A visit to Wentworth Woodhouse by the Prince of Wales and the Duke of York in 1789 helped secure the social reputation of the family. Over 20,000 people congregated on the lawn at the house to witness their visit. In 1835, a young Princess Victoria stayed at Wentworth Woodhouse for a few days. She wrote in her diary about the house: “It is a very fine edifice, and is an immense house…it would be impossible for me to attempt even to give anything like a description of it.” She found it large, nicely furnished, and enjoyed exploring the estate. However, she found the custom of the house that the chaplain precedes the party to dinner as “peculiar”. In 1841, over 1,000 staff were employed on the estate, working in occupations that included housekeepers, carpenters, gardeners, stablehands, gamekeepers, and even rat catchers. Tens of thousands more would be dependent on the Earl, working in the many coal pits and pit villages owned by the family. The 6th Earl Fitzwilliam had eight sons, all called William, and six daughters. At his death in 1902 with so many children and a net worth of 3 billion, it would have been almost impossible to foresee the decline in family fortune and the end of the Earldom by 1979. Family secrets and scandal would erupt around the succession of the 7th Earl Fitzwilliam, leading to a legal fight. It was believed that William “Billy” Fitzwilliam, son of the epileptic black sheep of the family Viscount Milton, who was born in a remote Canadian frontier cabin, was illegitimate and family members claimed he was a changeling and had no rights to the family inheritance. Billy Fittzwilliam won the case and inherited the title, but no conclusive evidence was ever produced either way. In 1904, electricity was first installed at Wentworth Woodhouse and later central heating and running water would also come to the house. In 1912 King George V and Queen Mary stayed at Wentworth Woodhouse on a royal visit to Yorkshire to visit local coal villages and collieries. A total of 76 bedrooms were required for the royal visit and tens of thousands of people lined the streets and gathered in the park to see the royals. Special entertainment such as a performance by the Russian ballerina Anna Pavlova was arranged for the king and queen. During the visit, King George V would descend into the Elsecar coal pit (one owned by the Fitzwilliams) and did so following a tragic mining disaster at nearby Cadeby Colliery. While the Fitzwilliams were generally seen as responsible and respected owners for the time, the terrible conditions of collieries and pit villages in general would lead to intense criticism and a perceived need for nationalization. During World War II, Wentworth Woodhouse was used by the military, primarily the Intelligence Corps. They occupied the stable block and parts of the main house. Floorboards would be put down to cover marble floors, dust sheets would cover the furniture, art and personal objects packed away, and rooms would be padlocked to create storage areas for the family’s belongings. In 1944, Peter Wentworth-Fitzwilliam, the 8th Earl Fitzwilliam, was awarded a Distinguished Service Order for his courage during service in World War II. Following WWII, the government ordered opencast mining in the gardens next to Wentworth Woodhouse. The mining would ruin the gardens and make it very difficult for the family to live in the home, and eventually it would lead to the house’s current foundational issues. The 8th Earl was well known for his drinking, gambling, and womanizing, and he was rumored to have fathered a few illegitimate children with local women of the pit villages. In 1946 Peter Wentworth began a romantic affair with the widowed American Kathleen “Kick” Cavendish, Marchioness of Hartington, sister of future U.S. President John F. Kennedy. Peter Wentworth-Fitzwilliam and Kathleen were killed in a plane crash during a thunderstorm in France in 1949. At the time, the powerful Kennedy, Fitzwilliam, and Cavendish families closed ranks to obscure the nature of their relationship in the press to avoid scandal. 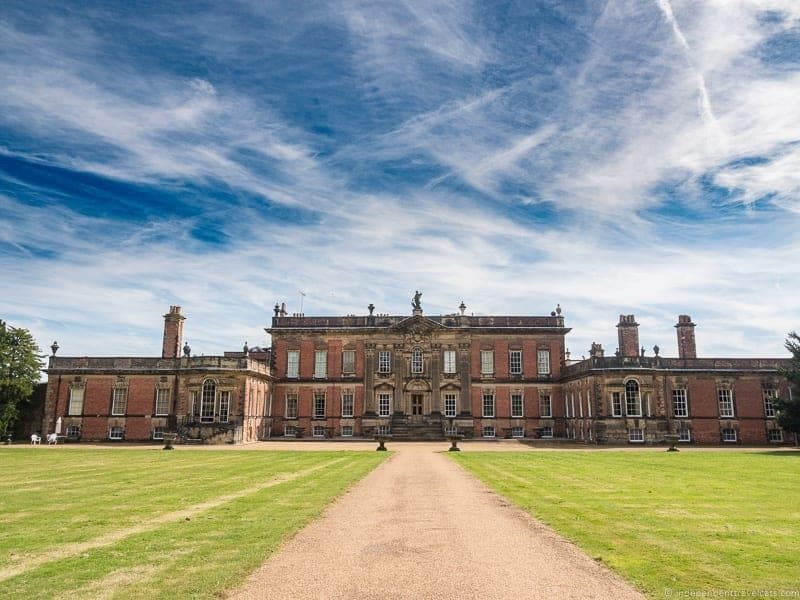 In 1949 following the death of the 8th Earl Fitzwilliam, the family sold a significant amount of the contents from Wentworth Woodhouse, including a large amount of art and furniture. The family’s financial situation had been reduced after the payment of death duties and the recent loss of profits after the nationalization of coal in 1946. The house would then leased to be used as an educational facility for female physical education by the Wentworth family, a decision championed by Lady Mabel Fitzwilliam, sister of the 7th Earl Fitzwilliam. The Marble Saloon, where Anna Pavlova had danced for King George V, would be used as a gymnasium and the Whistlejacket Room would be used as a dance studio! It would continue to be leased as an educational facility until 1988. In 1952, scandal about legitimacy would rock the family again upon the death of Eric Spencer Wentworth-Fitzwilliam, the 9th Earl Fitzwilliam, who died childless. A cousin, George “Toby” James Charles Wentworth-Fitzwilliam was the next in line to inherit; however, his mother had made claims that he had been born out of wedlock after he chose to marry someone she believed was below his class. These spiteful claims would lead to him losing a court case brought against him by members of his family, and his younger brother “Tom” (William Thomas George Wentworth-Fitzwilliam) would become the 10th Earl Fitzwilliam. In 1972, the 10th Earl had tons of family documents and records burned over a period of 3 weeks at the house, destroying vast amounts of information about the family and house. It is not known what information he destroyed or why, but it is speculated that documents related to his brother’s legitimacy may have been included. The last Earl Fitzwilliam, the 10th Earl, would die at Wentworth Woodhouse in 1979 without an heir. The title Earl Fitzwilliam is now extinct. The house would be sold by the family in 1989. Laurence and I drove south to Wentworth Woodhouse from Edinburgh, and we arrived a bit early for the tour. We parked in a parking lot in Wentworth as we were not sure if we could drive down the private lane and park in front of the house. It turns out we could have parked in front of the house and directions about parking direction were included on our tour booking confirmation (check the email confirmation). We had actually been to Wentworth Woodhouse before but on our previous visit we had only viewed the house from the park. We were excited to actually go inside and see the interiors! On our walk to the house, following a path through the park, we made a brief stop to look at the massive stable block designed by John Carr in the 18th century and could accommodate about 100 horses! There was also a riding school here. The stables building is huge and it is not surprising that some visitors stop here, thinking they’ve reached the house! 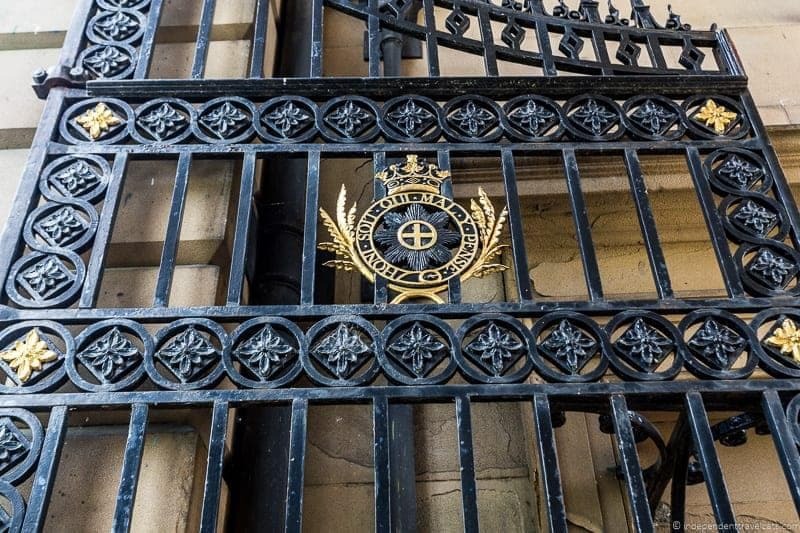 A motto on the gate into the stables reads: “Honi soit qui mal y pense”, a common British heraldic motto, which translates to “Shame be to him who think evil of it”. Instead of going straight into the house, we walked onto the front lawn to try to take it all in. If you are taking a photo, you need to be quite a distance away from the house to get it all in! As we stood in front of the Palladian style East front of the house, we were struck again by the immense size and length of the house! Wentworth Woodhouse is the largest private home in the UK and the house has the longest façade of any country home in Europe at over 600 feet in length. It is more than twice the length of Buckingham Palace; the physical footprint of the house is enormous! After going inside, we were greeted by someone at the front desk and our booking was checked. We were asked to go inside and wait in the lobby as the rest of the tour group were checked in and assembled. We were immediately struck by the entrance hall and staircase for the house. Known as the Pillared Hall, it is a grand foyer filled with a forest of pillars and neoclassical statues, leading to the main staircase. Here we got our first look at both the grandeur and immense size of this house. Unfortunately photography was not allowed on the tour of any part of the interior of the house so all interior photos were provided to us for media use by the Wentworth Woodhouse. This is a bit of a shame as some of these photos do not do the house justice, but it will give you a sense of the inside. However, they have recently changed that policy and photos are now allowed during the guided tours inside the house. Soon our group (I think there were about 10 of us) was greeted by Robert “Bob” Mortimer, and he told us he’d be our guide for the house portion of the tour. We had booked the 2 hour Fitzwilliam Tour, which was the longest and most comprehensive tour offered at that time and includes a number of the primary rooms in the house plus a garden tour. NOTE: The Fitzwilliam Tour is not currently being offered (as of Septemeber 2018) but it was essentially the current Wentworth Tour + The Garden Tour. We started in the Pillared Lobby and soon after he lead us to a room containing a model of the house and talked about the architecture and layout of the house over the years. After giving us a bit of history, Bob revealed that he had worked as a house carpenter for the 10th Earl of Fitzwilliam and so he knows the house better than most people. He has been giving tours for the house since it opened to the public. We felt very fortunate to be touring the house with such a knowledgable person! The house is massive and the tour took us through a circuit of rooms which included public spaces, a dining room, bedrooms, and long corridors. Some rooms were furnished, some rooms were not furnished. The house is said to have about 365 rooms and five miles of passageways! Another tour guest asked Bob about the exact number of rooms, and he explained that is very difficult to give an exact count but noted that there are over 300 rooms. He explained that not only would it take a lot of time to try to count them all, but it is hard to classify what is a “room” given that there are anterooms, storage spaces and cupboards bigger than bedrooms, giant corridors filled with furniture and artwork, and the like. This helps explains the large discrepancy in the room count for the house. Even Princess Victoria during her 1835 visit couldn’t help but keep noting the “immense” size of the house despite growing up in a palace and being a guest at all the large country houses. As we made our way through a confusing series of rooms, it is easy to see how guests of the family would have gotten lost in the house! In fact, Catherine Bailey notes that getting lost was a common problem for guests at Wentworth Woodhouse. She wrote that “One guest, a Baron von Liebig, resorted to crumbling wafers along the route from his bedroom to the dining room so that he could find his way back after dinner. Thereafter, guests were presented with a crested silver casket containing different-coloured confetti.” It is interesting to imagine aristocratic guests leaving bread or confetti trails as they made their way from the dining room and Marble Saloon to their bedrooms! Some of the tour highlights, which are included on the Wentworth Tours, are the Pillared Hall, staircase, Marble Saloon, Whistlejacket Room, Van Dyke Room, and family chapel. Like the exterior of the house, the interior decorative and architecture styles are mixed as you move around the house from Rococo to neoclassical. The house is massive and we only got to see a small number of the actual rooms! During our tour, we were able to see both the grand scale of the house and imagine its past grandeur as well as get a sense of the need for restoration. It is likely that more rooms and tours will open to the public in the near future as repairs and restoration work are done to the house. We saw water leaks, cracks in the plastered ceilings and walls, peeling paint and wall coverings, and lots of flooring that looks like it needed replacing, including places we were not allowed to walk because of instability issues. Some rooms during our visit had been recently repaired and decorated to be used for TV or movie filming. The house has been used for British TV miniseries Wives & Daughters and Jonathan Strange & Mr. Norrel, the TV drama series Victoria, as well as a few films such as the award-winning Mr. Turner and Darkest Hour (fills in for Buckingham Palace in the Winston Churchill film). The house which once included a priceless art collection, containing a number of works by Titian, Van Dyke, and Raphael, includes very little of its original art or furniture. 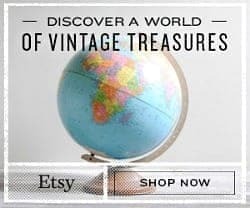 There are a few pieces of decor as well as a number of statues that are still in the house, but most of the art was removed by the family after World War II and is held in private collections or is on display at museums. Lady Juliet Tadgell, daughter of the 8th Earl Fitzwilliam, inherited a large amount of the art and it remains in her private collection. 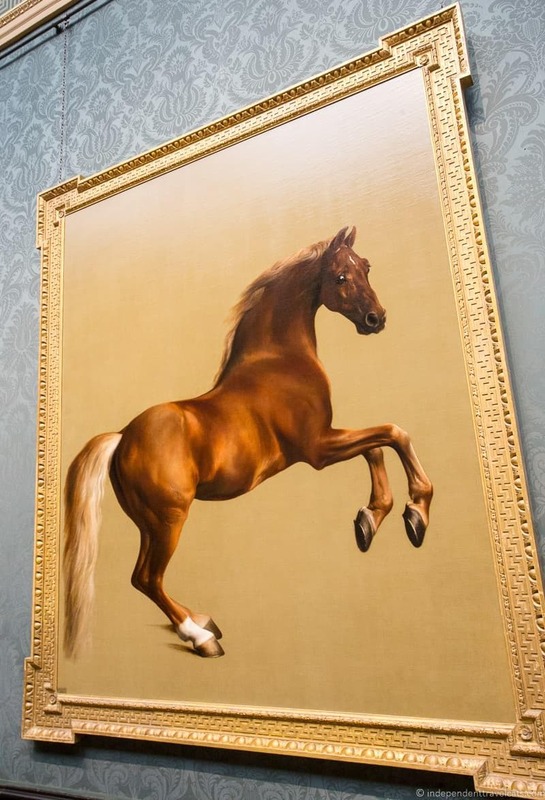 Perhaps one of the most famous pieces of artwork associated with the house is the life-sized painting of the horse Whistlejacket by George Stubbs. The painting of the family’s Arabian racehorse was commissioned by Charles Watson-Wentworth, and is well-regarded as one of Stubbs’ finest equine paintings. The immense painting hung in the Whistlejacket Room but today there is only a copy at the house as the original now hangs in the National Gallery in London. Our guide Bob explained to us that at the current time, given the need for house repairs and the money need to insure and preserve the artwork, it is not feasible for the art to be maintained at the house, but it is hoped in the future that some of the original pieces could be loaned or donated back to the house. The most famous room in the house is probably the Marble Saloon (a.k.a. the Marble Hall). This 60 ft. square grand room is 40 ft. high and was designed in the Georgian style. The ceiling plasterwork by Jonathan and Joseph Rose is an impressive work of art and is reflected in the design of the multi-colored patterned marble floor. This perfectly proportioned room is surrounded by statues along the ground floor. There is also place to walk around the top accessed from the upper floor to get a good view of the room from above although the flooring is currently unstable. The Marble Saloon is the grandest entertaining room in the house and was used for balls and performances. Laurence and I had a little dance in the rooms ourselves although I don’t think our dancing skills are quite on par with Anna Pavlova who once danced in the room during the royal visit of King George V & Queen Mary in 1912. This grand room would be covered with wood when the military arrived during World War 2 and then soon after was used by the women’s physical education college as a gymnasium! As Bailey writes, this grand room was “filled with climbing ropes, vaulting horses and balancing beams”. There is definitely damage from its time as a gymnasium, but not nearly as much as we would have imagined. The house tour focuses primarily on the time it was occupied by the Watson, Wentworth, and Fitzwilliam family members, but information was also included about the time the house was used by the Intelligence Corps during the war, its time as an educational institution, and most recently as a private residence for Wensley Haydon-Baillie and the Newbold family. The Newbold family were still using the house as a private residence during our visit, and they mainly residing in the West Wing of the house and used the East wing only for entertaining. I believe they have since moved out of the home. Our tour focused mainly on the East Wing of the house but parts of the West wing are also open to public tours. After the ending of the house tour, Bob took us to the small tea room and we waited for another guide to take us out to the garden. Refreshments and snacks were available for purchase. he gateway, or stone wellgate, here is believed to have been moved from its original spot and has been attributed to famous British architect Inigo Jones. We then ventured into the garden and our guide showed us some decorative elements of the garden, historic trees of note, and the kitchen garden that was still being maintained by the Newbold family. The historic gardens at Wentworth Woodhouse have been found to include many trees which are classified as exceptionally old, large, and rare. It was here in these gardens that the opencast coal mining took place after WWII and the gardens are still recovering from the effects of that mining. 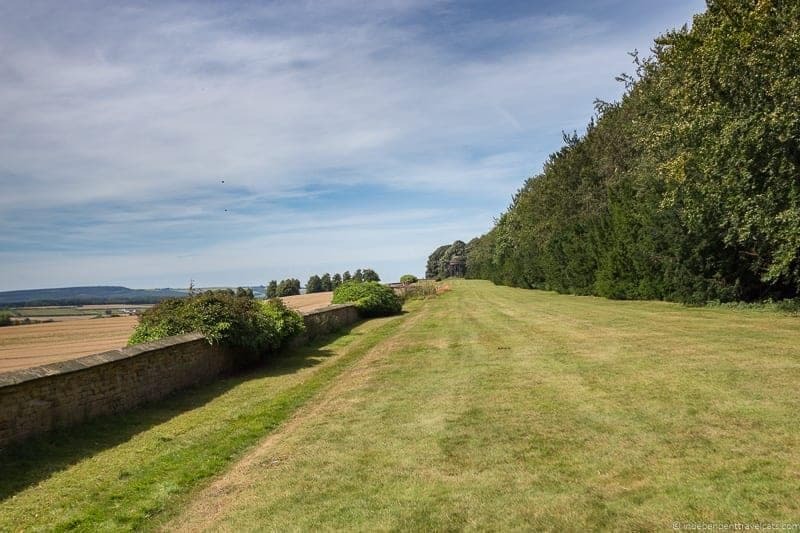 One of the highlights for us of the garden tour was the South Terrace which has a very long wall and a raised area along it that was used for the family and guests to sit, relax, and take exercise. From here, you have a good view over nearby park and farmland. 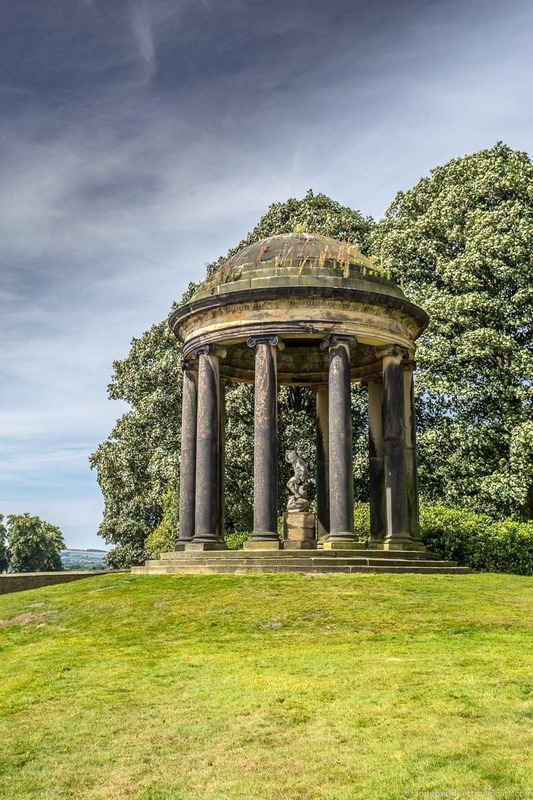 At one end of the terrace is an Ionic temple folly made of sandstone believed to have been built around 1735 by Henry Flitcroft. It has a statue of Hercules inside killing a beast. After going through the garden, we returned and ended the tour with a great view of the West front of the house. In front of the West side of the house once stood a 300-year-old beech lined avenue and famous pink shale ornamental driveway and path that led to the front door of the house, both destroyed by the opencast mining. The Baroque part of the house, although perhaps not as grand as the Palladian East front, is a still a great sight to behold. Wentworth Woodhouse is definitely a house with two faces and a multitude of tales! Which side do you prefer, the grand Palladian East front (top) or the English Baroque red brick West front (bottom)? 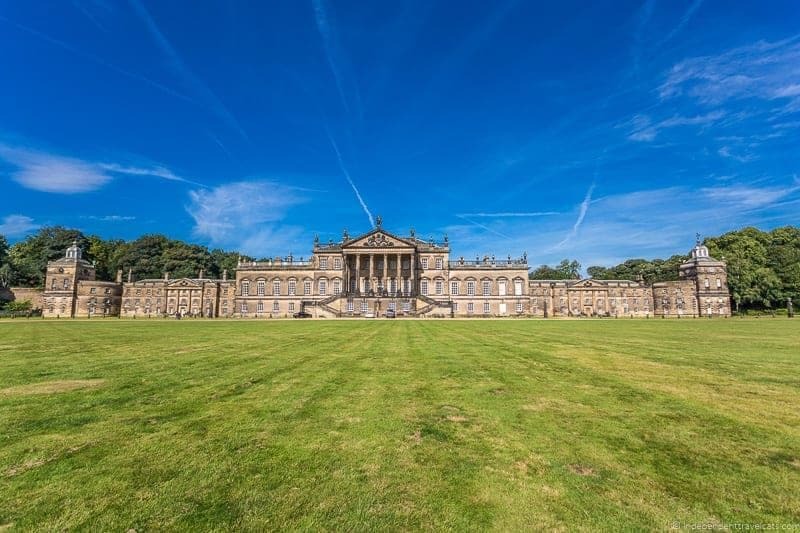 We hope you enjoyed learning about Wentworth Woodhouse and reading about our tour of this great English house! 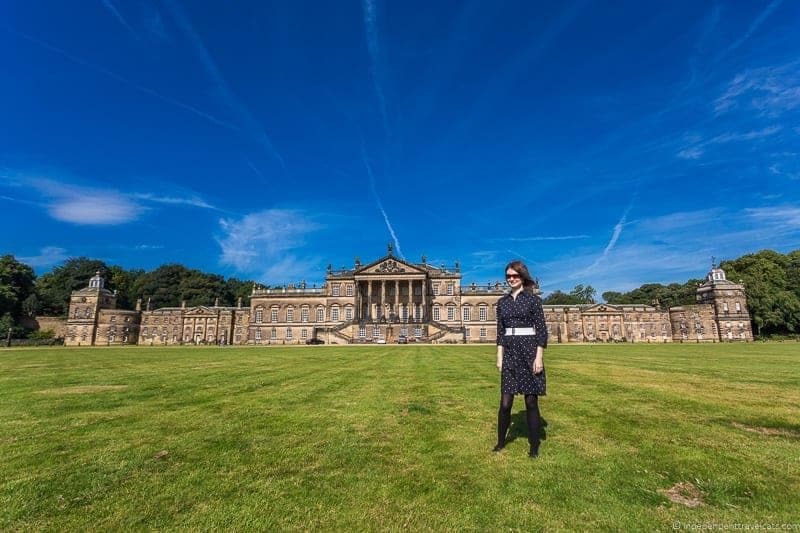 We greatly enjoyed our tour of Wentworth Woodhouse and this is a place we hope to visit again to see the progress as larger restoration and repairs begin once the government funds are made available. Wentworth Woodhouse, once home to one of the wealthiest aristocratic families in England, has been on the brink of decay and destruction in recent decades. Although there is much work to be done, the house has survived and the public has continued to show interest in preserving this architectural treasure. As one of England’s great houses, I hope it is restored and that some of the original art and furnishings can once again festoon this magnificent house. Although the house is still not well known to the general public, I have a feeling that will change in the near future! We hope you enjoyed learning about Wentworth Woodhouse and coming along on our tour of this great English house! 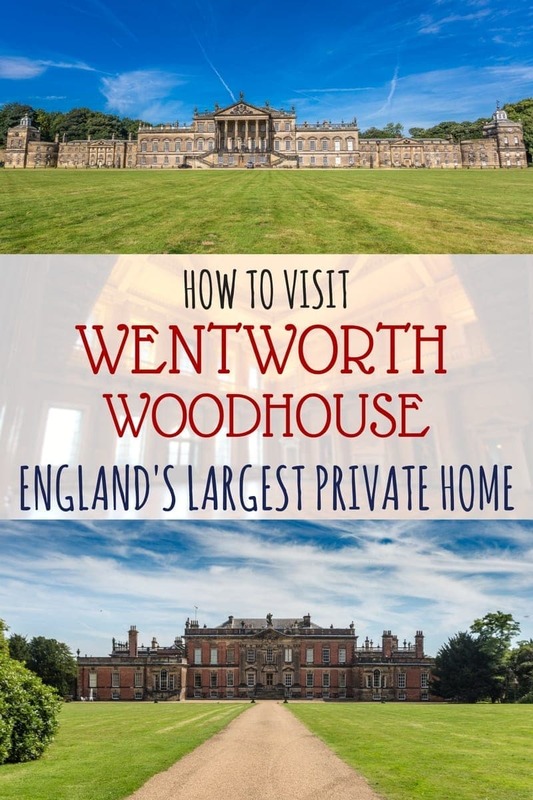 Have you ever heard of Wentworth Woodhouse before? Would this be a place on your Yorkshire trip itinerary? If you’ve visited yourself, we’d love to hear about your experience, and as always, we’re happy to answer any questions you may have about visiting Wentworth Woodhouse. 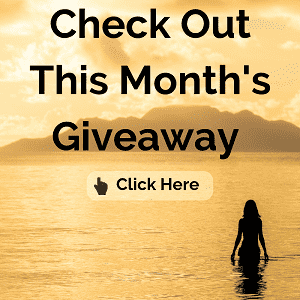 Just leave us your comments or questions in the comments below! Thank you for your detailed post about Wentworth Woodhouse. I’ve long wanted to visit the house and castle but something else always got in the way. Plus, I’m usually in the UK in December which isn’t the greatest month to head in that direction. Anyway, it looks like it’s going to finally happen this year, hence Googling and finding your informative post. Nice job. I’ll be sure to read it again shortly before my trip. Having discovered whilst researching my family tree that I’m related to the Wentworth family through marriage (my cousin Sarah Cox married William Charles Wentworth – part of the Australian branch of the Wentworth family – and very famous in his own right as an explorer, politician in the early colony – research Vaucluse House for further info) – I have since researched a lot into Wentworth Woodhouse and the family. Hi Stephen, So interesting, sounds like you have uncovered quite a bit of information in your genealogy research! 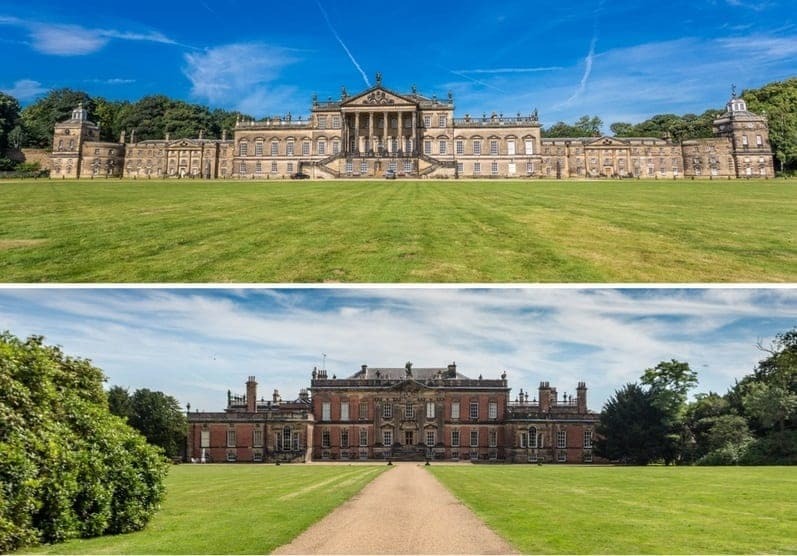 Yes, it does seem that the Wentworth family has a lot of connections and branches (for instance Wentworth Woodhouse and nearby Wentworth Castle were later owned by separate branches of the family). 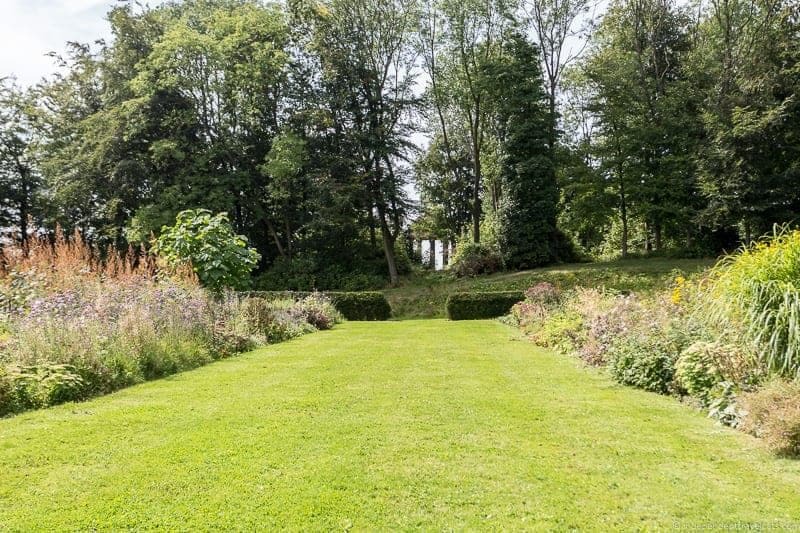 Speaking of which if Wentworth Castle & Gardens (the National Trust took it over in 2018) is re-opened to the public by your visit, I’d make a stop there as well. Wishing you a great summer trip! Thanks Jessica, I know William Charles visited Wentworth Woodhouse when he visited England with Sarah and went to see his cousin Earl Fitzwilliam who had supported William’s father D’Arcy Wentworth when he was in Australia as part of the colony foundation. One of D’Arcy’s homes in Australia was also called Wentworth Woodhouse in honour of the Yorkshire one. I don’t know if you are aware but It’s been suggested by a distant cousin of mine in books he has written that D’Arcy was well known to Jane Austen (perhaps even secretly married to her) as she is also distantly related to the Wentworth family and that the character Mr D’Arcy is in recognition of the fact. Many of Jane Austen’s places and characters have their basis in the family; Wentworth, D’Arcy, Fitzwilliam Woodhouse etcetera so it’s a possibility…. I first heard of Wentworth Woodhouse in the 1970s. We stayed with Lady Barbara Ricardo (daughter of Lady Elfrida Wharncliffe) in Wortley. However it wasn’t till a couple of years ago that i saw it from the outside, having read Black Diamonds a couple of years earlier, & managed a tour (mostly the Baroque wing) in Sept 2018. Talk about jaw dropping – photos really cannot do it justice. Thete is a lot needing to be done, but it’s good to see action being taken & the public welcomed into the house. Do visit if you can. I’m just sorry it took me 40 years! Thanks for the excellent article! I discovered your blog/website when I googled Wentworth Woodhouse having read a recent article in the Guardian. Thanks for posting these. Just finished reading “Black Diamonds” which ended up sounding like the wreckers ball would be the next chapter. Contrary to your comments photography has been allowed in the house since the Wentworth Woodhouse Preservation Trust bought it in 2017. I am a trainee tour guide there, so I know that this is correct. Also the estimated cost of restoring the house to it’s former glory is now 200 million pounds !!!!! Hi Rachael, As of January 2017 when this article was written, photography was not allowed indoors (this was the policy since 2012). Thanks for that information, I just checked with Wentworth Woodhouse and they have recently updated their policy to now allow photos which is great. We have updated our post accordingly. You’re right – we had never heard of Wentworth Woodhouse…but we sure want to go see it now! That facade is just beautiful, and we do have a fascination with how “1%” of old lived. 😉 Looking forward to seeing this architectural beauty! Wentworth Woodhouse looks amazing! I can see why guests would have trouble finding their way back to their rooms. It’s quite funny to think of them leaving a trail of crumbs so they can find their way back! This place may be private and considered a house but it surely looks like a palace to me. It is so grand and majestic! Love the elegant facade. I really enjoy reading about the places you visit. History nerds like me dream of stopping by these areas one day. Absolutely enthralling to read! I’ll be saving this for a future visit! I would love to visit more of these private estates the next time we are in England! Such a shame that these family homes were lost to the families as the decline of aristocracy became more predominant. I love this glimpse into history! For me, it is the the little details (like the 1,000 employees) that really intrigue me. Ever since Downton Abbey I’ve been fascinated by these grand old homes and the way people lived. I would adore going on this tour. It was a unique period of time with incredible stories! 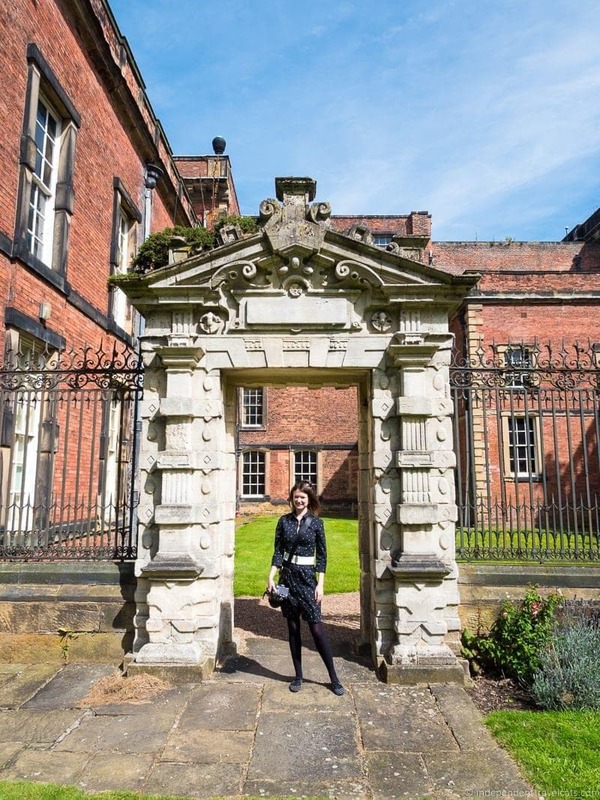 I have to agree with (then) Princess Victoria, “It is a very fine edifice, and is an immense house…” Unlike her, however, you gave an excellent description of it! I love learning about places like this! They certainly don’t make them like that anymore! Wow! I learned so much from this post. First, I had no idea about Wentworth and then all the history. It really looks quite impressive and definitely worth taking the time to visit and tour. What a grand home, and it looks very familiar. Now I know why. Victoria and Jonathan Strange & Mr. Norrel, I enjoy visiting historic homes when I go places so I will keep this in mind. Love the list of facts! Fun to know Ben Franklin traveled through the area. Thanks so much for sharing. I’m reading Black Diamonds now , and over and over again, I keep thinking…what a fantastic series or Blockbuster film it would make …and I’m only just over half way through !! A lot of interesting facts about Wentworth Woodhouse, Jessica! Your posts are alway so comprehensive that it feels like I have already been there. This is an enormous residence, indeed. It will require a lot of funds for restorations for sure.